For those wanting to have some Laker Apparel please visit the link below. The site will be open until April 9th. Multiple color options available, please note the delivery dates of the items. All gear is optional, nothing is required. The Lakers will be also selling separate from the online order form a Nike Shirt. Below is the photo of that shirt, and the cost is $17. Please contact me directly if would like one of these shirts. The sizes are in Men’s. Congratulations to 2014 5’9 Guard Ashley Younger from Dodgeland on commuting to Wisconsin Lutheran College. Ashley had a very good season surpassing the 1,000 point mark and being named First Team All Conference. Wisconsin Lutheran won the NACC regular season as well as the conference tournament. Wisconsin Lutheran made a trip to the D3 NCAA tournament. Congratulations Ashley. Congratulations to Lauren Stanich from Shoreland Lutheran who has committed to NCAA D3 Loras college. Lauren was a member of the Wisconsin Lakers last summer, and had a very good season for Shoreland averaging 11.9 ppg for the Pacers. Lauren will be a great addition to a program that won the IIAC and appeared in the NCAA D3 National tournament. A key part of Lauren’s decision was the academic’s side of things as she is a great student. Very proud of Lauren and we wish her all the best at the next level. Wisconsin Lakers are proud of our All Conference players. Please make sure update me once everyone knows. Below are who have been selected to this date and there will be a lot more added to this list over the next week or two. 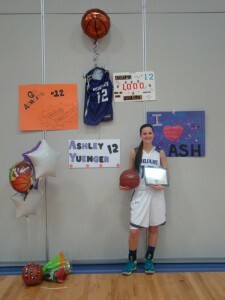 Congratulations to Dodgeland Senior Ashley Yuenger who went over 1,000 points for her career. Ashley averaged over 19.5 points per game this season. Ashley was a member of Wisconsin Lakers Black and joins three other Laker Seniors to go over 1,000 points in their career this season joining fellow Laker Black teammates Kari Clements, and Mary Hirt. Emily Schmidt also went over 1,000 as well. Congrats on a great season Ashley.